No more ugly rope, bungee cords, twine or duct tape! Secure your air conditioner cover or swamp cooler cover in high winds! Keeps cover corners from ripping. Cover lasts longer. Professional looking. No-rust buckles. A make sense product! 250 lbs. pull strength. Strong one inch wide nylon web strapping. Long lasting weather resistant and easy to use. Keeps air conditioner cover from shifting and ripping during periods of high winds. Made for outdoor use. Great under extreme UV exposure and harsh weather. Cinch-up the 2 straps quickly and easily to secure your evaporative air cooler cover tightly around your outdoor unit. 1. Measure one strap length completely around your unit and add 8 extra inches. 2. Type in the total inches needed for one strap in the appropriate window above. 3. 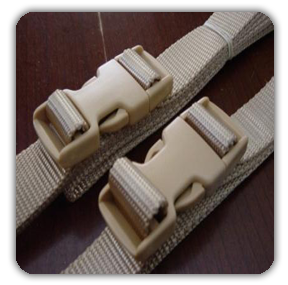 Click on "Add to Cart" Your order will be for a 2 strap set. Example: 138 inches around the unit + 8 extra inches = 146 inches. 146 inches would be in the "Long" strap size range. You would select the "Long" drop down, then type in 146 inches in the window.